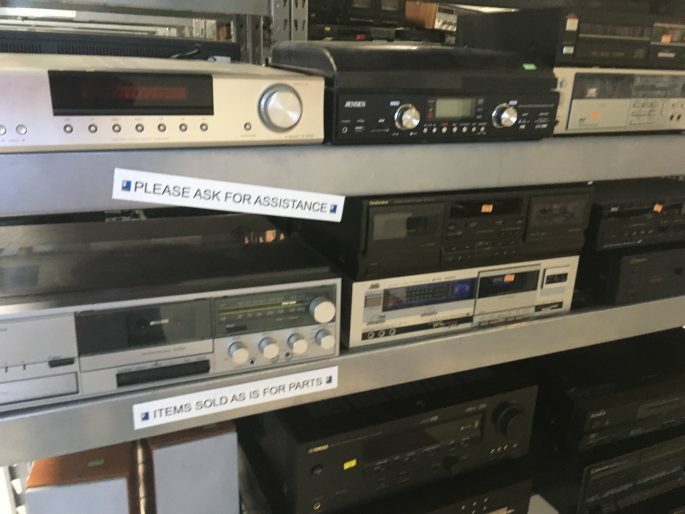 This week, I thought it might be fun to talk about places to find cassette decks, as well as some principles behind picking out potentially good decks on the used market. Despite cassette sales rising considerably in recent years, there aren’t really any legit new decks. If you want noisy gadgets w/USB outputs intended to make mediocre mp3s out of your parents’ old tapes, sure, there are a few decks and walkman-style devices you can get on the cheap. But if you really want to hear what’s on those all those new tapes you’re wrangling from around the world, you’re going to need to think about strategies for finding old decks. 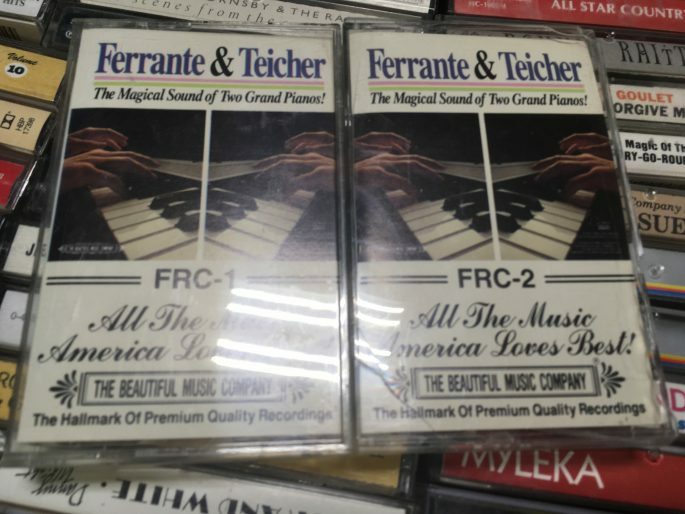 There are some online forums where you can find useful information about decks, but it seems to me that there are, broadly speaking, two kinds of “cassette enthusiasts” out there these days. The first is the audiophile/retrogrouch type of person, and that’s where most of the forum chats tend to gravitate. 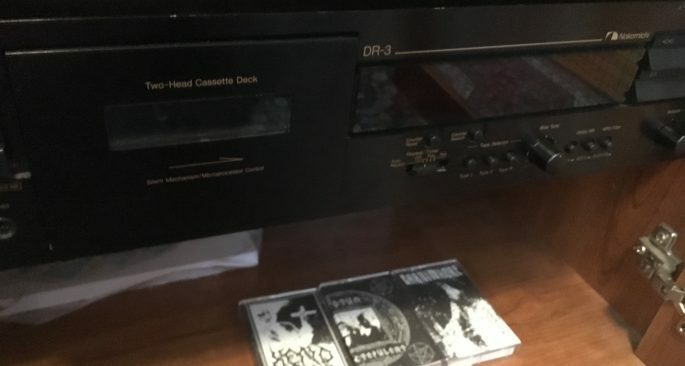 These folks spend more money on ancient new-old-stock blank metal (Type IV) tapes than it costs to snag the latest title on your favorite underground tape label. When they’re not comparing the differences between different years of Type II chemical formulations for popular blank tape brands of the 80s, they’re trying to make perfect copies of their pristine records on tape onto these godforsaken overpriced blanks. But I think most of the readers of Tabs Out will fall into the 2nd category, which is a bunch of ladies and gentlemen whose main goals with tape are simply enjoying new music. 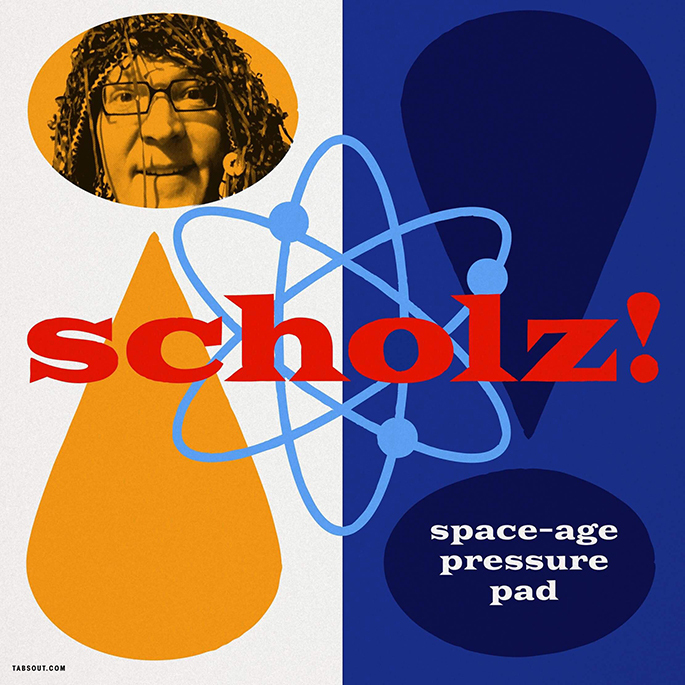 That includes us here at the Space Age Pressure Pad, where the colloquial “we” think records and tapes are meant to be played, and blank tapes are for recording and dubbing brand-new music to get out there in the world. So there are going to be some practical considerations that might differ from the habits of home-audio(phile) enthusiasts: you want jams to sound as awesome as possible, of course, but you don’t want to spend your weekends rebuilding tape decks. You want to spend your money on new tapes and on music-making gadgets of your own, not rare cassette machines. And you might need to make small runs of copies at home on occasion, so dual decks aren’t so verboten as they are for the audiophile crowd. With those considerations in mind, let’s think about general cassette deck designs. What decks are we looking for? At the height of commercial cassette popularity, there were some truly astonishing tape decks produced. But there were also some budget and mid-priced machines that may do just what you need as a listener/microlabel operator today. 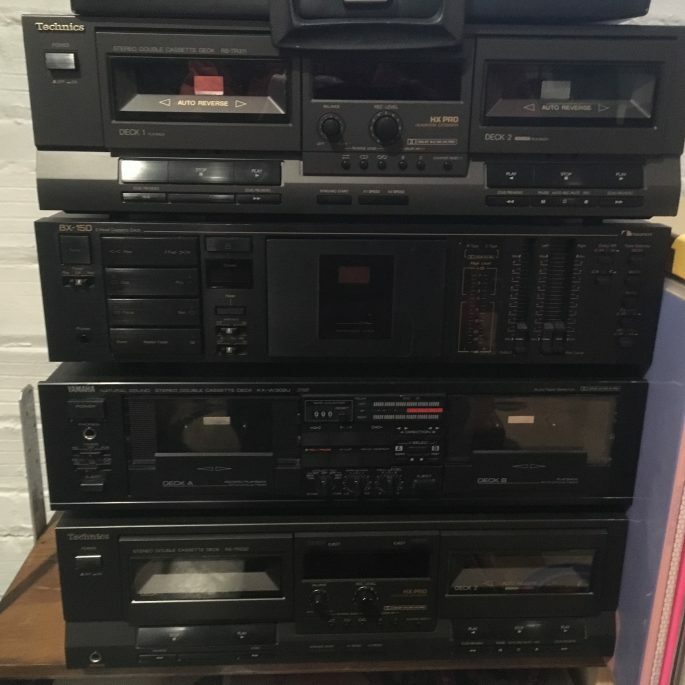 For our purposes, let’s divide the spectrum of cassette players you’re likely to find into three categories: consumer decks, professional decks, and audiophile decks. Consumer decks fell on the low to mid-priced spectrum, and you’ll find a wide range of quality among these. They tend to be built out of lighter materials, and they may have fewer features like direct pitch control, azimuth adjustment, tape type bias selection, or extended flavors of Dolby. 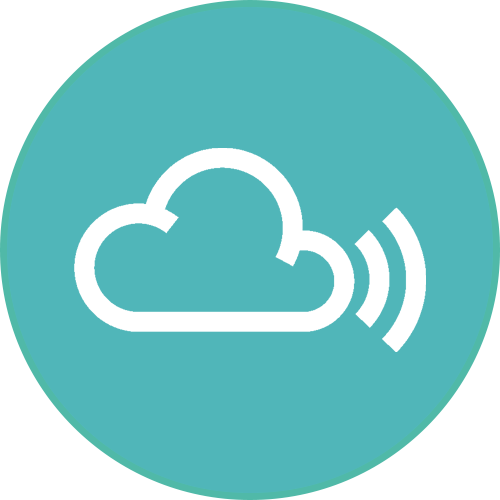 They’re almost certainly 2-head (record/play) designs rather than having 3 heads, which allows you to do some real-time monitoring of recording quality. Most of these are dual well designs, where you can have two tapes set to play, or dub from one tape to another. Most have single capstans, which means the tape might get a bit more “wiggle” as it’s playing, but sometimes you’ll find double capstans, or maybe double capstans in the “record” deck and a single in the playback-only deck. Semipro Tips: look for late 90s/early oughts models–these were often “deal sweeteners” thrown in for free when folks were buying speakers/amps/CD players at stereo and big-box stores, and they probably weren’t used much by their new CD-rocking owners. Or they just “came with” the overall stereo setup, that sort of thing. The decks from that vintage might not be as heavily built as 70s and 80s decks, but they’ve also spent a decade or two less in hot/humid conditions in attics and basements than their older siblings, with corroding circuit boards and dried-out belts and rollers. Some probably-reliable brands: JVC (I have great luck with modest old JVCs sounding awesome), Technics, Yamaha, Sony, some Nakamichi, Technics, NAD, Pioneer, older Aiwa, Akai, etc. There were decks marketed as “professional” decks, which you could often recognize by the inclusion of rack ears in their design. Generally in the middle to upper-middle price range, and intended to be good-sounding and mechanically durable workhorses for places like recording studios and radio stations, these machines were built to handle a little more use than your typical lower-priced consumer tape deck. Some of these are dual decks, and some are single. Most have double capstans. Semipro Tips: I think the Tascam 202mk line is a pretty solid choice for doing home dubbing, and they sound pretty good for listening, too. But if you’re going to work with Dolby, be warned that the 202mkV was the last of the line with Dolby B–the VI doesn’t have it. And I have to be honest: I think Dolby B is a good thing for most program material. Almost all of the consumer-grade decks will have it, too, and it’ll keep most hum/hiss out of your quiet passages for your future tape-buying audience. Brands: Tascam, Marantz, some Yamaha and Denon models, etc. Then we have audiophile-grade decks. These mysterious creatures tend to weigh a ton, and they have enough knobs and switches to emulate an airplane control panel. These are gonna be single decks with double capstans. Semipro Tips: Lots of bells and whistles means lots of potential problems. Proprietary parts. Complicated inner workings. No dubbing tape-to-tape. But if you’re got the scratch and they’re in great shape, you’ll have a great time listening to synth zoners and noise walls in the equivalent of analog technicolor, like some kind of cassette royalty. In general, I stay out of the fray in the audiophile scene, because there’s no way I can justify spending what these decks go for. However, if you find something like a Nakamichi Dragon at your local Goodwill for 20 bucks, you gotta go for it, obviously! Don’t even test that thing, just bring it home and figure out how to proceed later. Brands: Nakamichi, Tandberg, Luxman, Bang & Olufsen, various top-of-the-line models from other companies. Thrift stores: in my area, we have a Goodwill dedicated to electronics gadgets. There’s a lot of junk, and a lot of broken junk, but every few months something cool shows up for a pretty good price. I’ve snagged a number of useful decks and walkmans there under 20 clams. It’s always worth a look at these places, especially if they have a testing area. 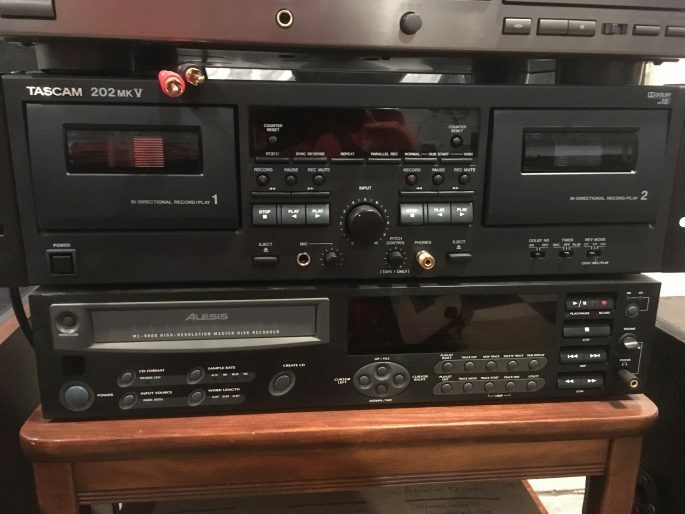 Craigslist: I’ve snagged a few good decks from CL postings–and sometimes it’s from seeing a cool deck in the background of a photo for somebody selling a power amp or speakers or other stereo junk. They may be planning to just toss the old thing, assuming that nobody would want to buy a cassette deck in 2018. Give ‘em an email or a call if you spy something cool. Facebook marketplace: this is starting to take off, so keep an eye on there, too. Pretty much the same principle as Craigslist: peep those stereo gear listings. Garage sales: you find cool tapes and records for next to nothing sometimes, and that happens occasionally with tape decks, too. There’s a fellow near me who seems to scrounge around rather successfully for old electronics, including decks, who has an ongoing garage sale nearly every weekend, and if you find folks like that, tell ‘em what you’re looking for and leave your number. They might have better luck than you! Dumpster diving: I bike around more than drive, and I’ll see folks put turntables and tape decks out for the trash pickup sometimes. The price is right, no? Snag now and test later. Ebay: maybe it’s come to this? You’re going to pay more, no doubt, but if you see what you want and you can swing it, save yourself some time. Be aware that these decks are just as likely to have near-failing parts as something you find in a thrift store, though, even if the seller says it’s all tip-top. And shipping old machines has a way of rattling parts loose, so you’ll want to do a good once-over on your new deck upon arrival. But there are deals to be found even here, especially if you’re looking for “sleeper” models that don’t have the kind of reputation folks associate with old Naks and that kind of higher-end mania. Take a peek in the tape well with the little light on your cell phone: is it pretty clean? Do the rubber parts look dried out? If the heads look shot, it’s probably not worth screwing around with it, unless it’s a fancy audiophile deck. And even then, just resell it at a silly profit on ebay to some tinkerer audiophile type and buy some more tapes. Take a quick look at the power supply cord and the buttons–if you have broken stuff or frayed wiring, best to just move on. We don’t want to be here all day evaluating junk, do we? Bring along a tape you’re familiar with to test decks–you’re listening for sound quality, background noise, sound stage, etc, hopefully both through headphones and through some speakers if possible. If that tape features a recording with prominent acoustic piano or mallet percussion, so much the better–you can check for wow and flutter if you hear instruments like those wavering up and down in pitch. And if you want to get really picky, stick your metronome with a tuning “A 440” note in your pocket (or maybe a tuning fork, or a tone generating app, whatever you’ve got), and bring a tape that has lots of A-notes with you. Then you can see if the deck is running fast or slow against a stable tuning pitch. If the tape has Dolby, give that a try, too. If you find yourself without a tape, but you’re at a thrift store, take a gander around–they probably have something that will work. Just be aware that if you hear a problem, it could be a janky tape, too. Maybe grab two of ‘em before testing. If it’s a dual deck and you’re going to be using it for some dubbing, bring a blank tape, too, and dub a bit of a side. Same deal: you’re looking for good sound, low noise, faithful stereo field reproduction, stable and true pitch. Upon bringing a new deck home, you should plan on doing some quick-and-dirty maintenance stuff just to make sure things are running as best as they can. I’ll often do some basic cleaning while the machine is still outdoors–you never know where it’s been, after all, so taking a look under the hood and searching for signs of insect life is probably a good idea. Then it’s a matter of a little compressed air, and you’re good to go. I’m not a wildly mechanically-inclined person, but there are some pretty painless basic maintenance things you can do to keep your decks working well without having to be a major electronics tinkerer. I keep a bottle of Rubber Renue on hand for rubber parts–just get a little on your rollers with a q-tip and let them dry off. For heads, very gently clean them with as high a percent isopropyl alcohol that you can find and another q-tip (don’t mix those q-tips up!). For various motor noises or just general upkeep, I use some light sewing machine oil–open the case on your deck, and look for the oil intake spot on your motor(s). Put a drop or two on a toothpick, and let it run down to the proper spot. No biggie, really. Beyond that, you might occasionally find yourself needing to replace a belt or an idler tire or something of that nature. These are pretty easy operations, and you can find tips on those cassette forums or by watching youtube videos. The parts tend to be super cheap from online supply stores, too–you’ll probably pay more for shipping the belts you need than the belts themselves cost. If things get more involved than that, I usually leave ‘em to the pros, but you can extend the life of these things for nearly nothing with just a little practice. And hey, if you found the thing for cheap and you make a mistake, it’s not too hard of a hit. There’s another thing that tech-oriented folks sometimes get hyper about, and that’s demagnetizing. Do you need to demagnetize the deck you just picked up, or do it on a regular schedule? The answer is often “no.” If you’re using a 2-head deck, you demagnetize the heads every time you take the machine in and out of record mode. If you’re worried about it, pop a tape in and hit “record” for a few seconds, then stop, and you’re back in business. In most normal situations, your deck needs an occasional cleaning more than a demag, which gets those magnetized particles out of there. However, if a machine has been sitting around for years with bits of tape oxide gunk inside, it’s possible that the heads will need a demag (and maybe even capstans with magnetic particles stuck to them for a long time). After the initial round, though, just keep things clean, and you’ll be good to go. Happy hunting, and more importantly, happy listening!